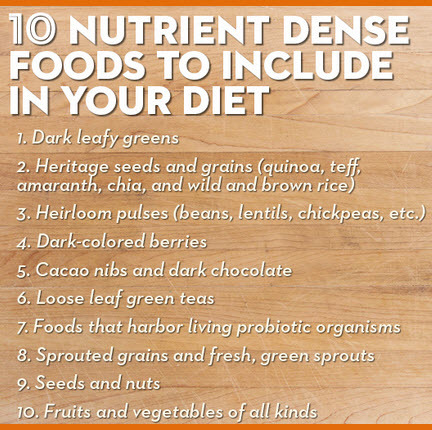 It’s not about eating less but better – what we need is nutrient-dense foods. 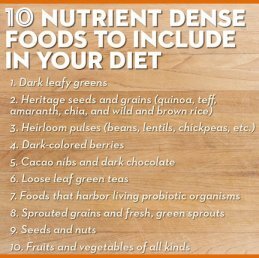 What are nutrient dense foods? They are foods that have a ratio of high nutrient to calorie value as opposed to empty calorie, nutrient – poor foods that are common place in our modern world. Refining and processing foods removes nutrients. Once these processes are applied to fresh foods, you no longer receive nutritional benefit out of them (very little at best). They are nothing more than edible food imposters. Sure, they may look like the same thing, but without any nutrient value they are useless to your health, metabolism and diet. When you switch to nutrient-dense healthy eating you are no longer focused on weight loss only. Your overall health has become your focus for sustaining weight loss. Losing weight is not a short term issue…losing weight is about keeping it off permanently for the long haul and training yourself onto a nutrient rich diet is the answer. A healthier and less toxic body…who doesn’t want that? Following mainstream diet plans are not the answer if you hope to experience all 8 results. If they were, we would not have a world-wide obesity epidemic. However, anyone who chooses to follow the nutrient-dense diet plan can expect success on all levels as they happen in the order above, one after the other, each one adding to and supporting the success of the previous one. When we give our bodies the nutrients it needs to be healthy, lean and active we are returning to our natural state of being. Our bodies will answer our calls to health…it is their natural state but they must have the proper nutrients to get them there and keep them there. Eating the nutrient – dense way puts you and your body on the same team. No longer will you be working against one another. Your inner glow is easily noted by others as is your energetic, youthful demeanor. People will wonder what you are doing differently to achieve your slimmer, healthier body frame. Nutrient – dense eating should not be referred to as a ‘diet’. It is not a diet, it is a lifestyle…it is part of your new lifestyle. Your plan can now be considered an eating ‘clean’ plan…one that only chooses the least processed, most nutrient – dense foods available. No more fast foods or mall food courts, it’s all about choosing fresh nutrient – dense foods over their counter-part processed boxed alternatives.